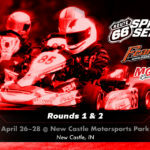 This past weekend, the Route 66 Sprint Series Presented by MG Tires and Franklin Motorsports opened the season at the New Castle Motorsports Park in New Castle, Indiana. Although rain was predicted for Saturday, none showed up during the race day, however the wind was constant all weekend, but at least the sun prevailed for Sunday. There were an impressive 164 entries on Saturday and 165 on Sunday, which is right on par with the 2016 turnout. With other race series seemingly struggling, the Route 66 Series seems to keep chugging right along. The Saturday morning driver’s meeting concluded with the distribution of door prizes provided by the Series and our sponsors. 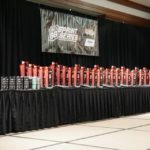 A Napoleon grill, several sets of MG tires, and PKT Axles Certificates were some of the prizes handed out to racers. There was great racing throughout the weekend, and for the first time, the PA audio was broadcast live via the Series website at www.route66kartracing.com/live. You could also listen via the Mixlr app on mobile devices by Following the Route66KartRacing channel. Recordings of the audio have been uploaded to www.mixlr.com and can be located on the Route66KartRacing channel. 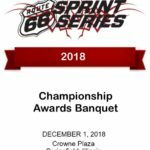 Comet Kart Sales sponsored the race weekend and the great chicken dinner for everyone on Saturday night. As the winds had gotten pretty hairy, we did the podium presentation inside the restaurant and it was packed, but still a good time was had by all. Although numerous penalties were issues over the weekend for dislodged nosecones, the racers began to figure it out by Sunday, and the positive response was overwhelming. The process was refined for this event and it was well received. Even better, not a single red flag was displayed all weekend and the on-site ambulance never moved. And while there were a couple crashes on the opening laps, there was only one wreck on the start of a race, which traditionally was a problem. Track configuration #29 was used and it featured the Bus Stop on the final straightaway, which led to some spectacular last lap pass attempts, with some even going partially through the grass. The next outing for the Route 66 Sprint Series will be June 16-18 at MRP in North Liberty, IN.